Who doesn't love Mardi Gras? I mean, you gotta love the beads, the music, the partying, the excess of yummy Nawlins foods... Good stuff, right? Of course, it comes right on the heels of the New Year aka Resolution Time. So what if you want to eat lower fat, lower cholesterol, lower calorie foods? Are you outta luck on the bayou? No sirree. 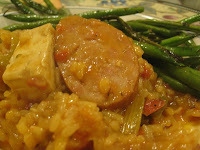 With a few modifications, you can make a nice, hot 'n' spicy, jambalaya! Drain tofu really well by placing it between paper towels and placing weights on top. 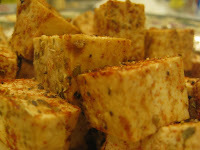 After the tofu has drained (about 10 - 15 minutes), cut the tofu into blocks and place it in a bowl. Sprinkle seasonings (soy sauce through cayenne) over the tofu and set aside. Meanwhile, put oil in deep, large saute pan and place over high heat. 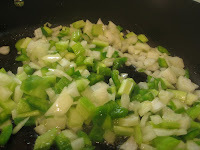 Add onions, celery, green pepper, and saute until tender (about 5 minutes). Add garlic through hot sauce, stir and let cook about 1 minute. Taste the rice towards the end of cooking, make sure the rice is tender. If you need, add some more stock. Gently fold in the tofu and the kielbasa, allowing both "meats" to mingle with the rest of the ingredients and get all warm and yummy. Pour a tall glass of your favorite Nawlins drink (I like hurricanes! 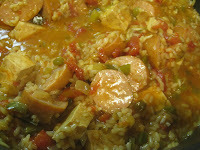 ), spoon your jambalaya into a bowl, and enjoy! In my humble opinion, soup is food's way of hugging you. Whether your dog knocks the kitchen garbage all over the floor, or your kids throw a tantrum over who's turn it is to have the horse sippy cup, or you're cold and tired and feeling flu-ish, soup sits in its bowl, warm and soothing, ready to say, "Hey, it's all going to be ok." With a few spoonfuls, the warmth overtakes you, and life just seems better. Of course, that doesn't mean your soup can't have an attitude, as in the case of Mexican Tortilla Soup. A little bit of spice can put an extra zip in your step - or an extra squeeze in that hug. So with the cooler temps this week, I'm ready to be swallowed by the love of some spicy and smooth loveliness. Now, you totally can make the soup from scratch--like, simmer the chicken in water with veggies to make the stock and then shred the chicken. Yadda yadda yadda. But sometimes I'm too tired and in need of that hug asap and I just want a shortcut. 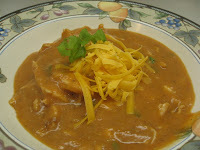 On days like that - this this recipe hits the spot! * Jalapeno gives this dish a nice kick. Want it super hot? Leave the seeds in. Want it super mellow? Use half a jalapeno and be sure to remove the veins and the seeds. Want it super-easy? Buy a can of diced tomato with diced jalapenos; you can't control the heat level, but all the work is done for you. Add olive oil to large, deep pan or pot over medium high heat. 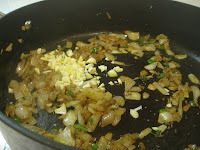 Add onions and saute until soft/translucent. If you are using a jalapeno, add it now. Add cumin, oregano and a dash of salt and pepper. Then add garlic, and saute for another a minute. Dump in the can of tomatoes--juices and all. 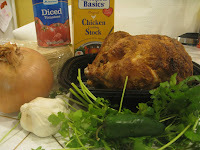 Add the chicken stock, increase temp to high and bring to a boil. 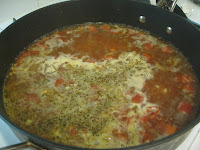 Reduce the heat (to medium low) and let simmer for about 30 minutes. 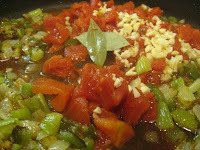 Meanwhile, get all your toppings together, make a nice margarita, pour a beer... enjoy the lovely aromas. After your simmer time, turn the temp down to low, and then throw in the tortillas. 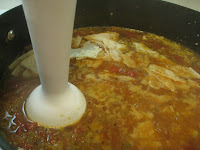 Carefully, using a hand-held blender (aka "boat motor), process the soup until smooth. Taste for seasonings and adjust salt/pepper as needed. 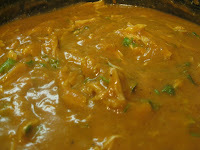 Add shredded chicken and cilantro, bump the heat back to medium, and let the flavors marry for about five to 10 minutes. Ladle into bowl or mug, add your favorite toppings and get ready for a big ol' hug of spicy love! Want to be super fancy? Fry a few corn tortillas, sprinkle with salt, and cut into strips. Throw those on top for garnishy-crunchy-yumminess.